Having spent the majority of my 25th birthday wandering around Downtown Manhattan under a baking late-spring sun, it was suggested that we head skyward come nightfall to get a different perspective of New York City. Riding the elevator to the 70th floor of the Rockefeller Center’s highest building, one can walk out onto an observation deck that stands 850ft above terra firma and get a remarkable vista that truly encompasses why the world’s second largest metropolitan area has been dubbed ‘The City That Never Sleeps’. Making our way across Tribeca (triangle below Canal Street), and up through SoHo (south of Houston Street), we reached the entrance at 50th and 6th slap bang on our ticket time of 9pm. The observation deck is such a popular tourist attraction that you get given an allotted half-hour time slot. Miss it and tough luck. We joined the queue at the metal detectors, and after going through the rigmarole of taking off our belts and emptying our pockets of any change we then found ourselves joining an even longer queue at the lifts. Here we were treated to the type of free show that could only be broadcast in The Big Apple. “You’re dressed so sloppily, that you look like the type of person who sells shoe laces for a living,” hollered one of the black security guards at his colleague scanning our tickets. The fact that they both had on the same uniform didn’t seem to make this put-down any less credible in his mind. “Oh, yeah? Well you look like the type of person who sells pillowcases but not pillows,” retorted his co-worker. I turned to my brother. Were we just about to witness a battle rap? Not only were my brother and I in stitches at this point, but, much to the disgust of the Chinese family behind us, the two friends were also creasing themselves with laughter at every new insult. Never mind that their job roles involved the serious matter of preventing terrorist threats, they were having way too much fun battering childhood insults off one another. A smile stayed on my face the whole elevator journey up to the Top of the Rock; remaining there as we stepped out towards a truly remarkable view. 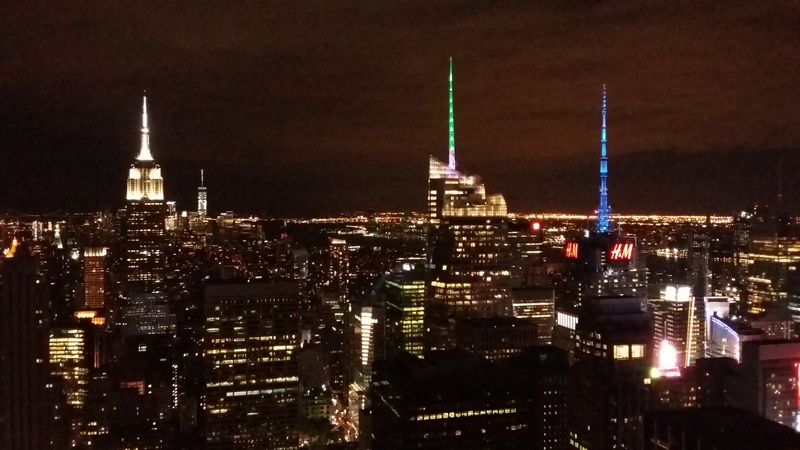 The whole skyline was lit up in front of us, neon beams jutting into the sky light light-sabers from the Empire State Building, Bank of America Tower, and One World Trade Center. Time seemed to stand still. 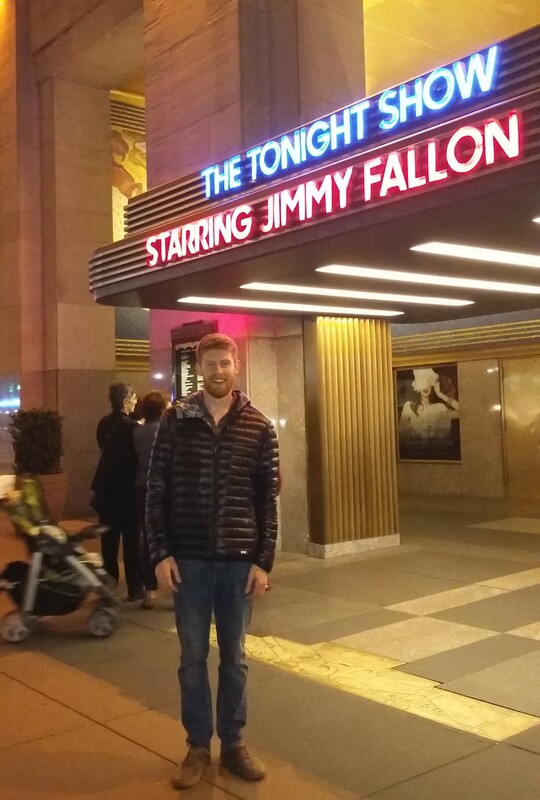 The Rockafeller Center is home to a number of late-night talk shows, so following our descent we wandered through the NBC studios where Jimmy Fallon was playing host to Blake Shelton and Kit Harrington for the evening. 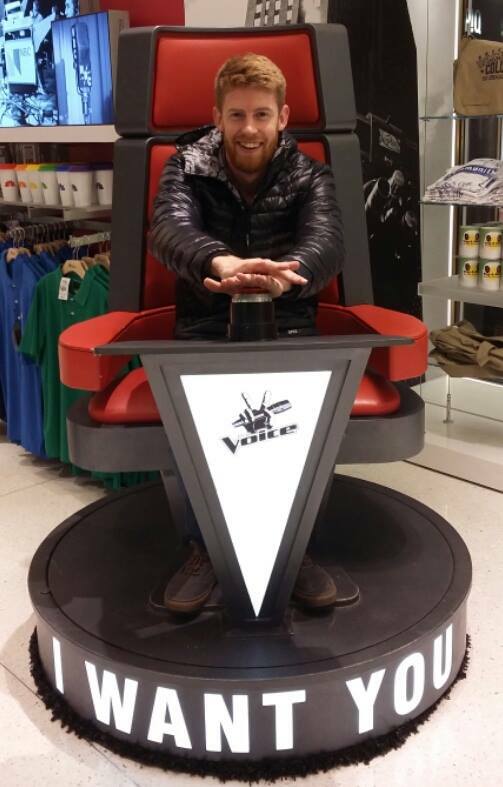 Unfortunately I didn’t manage to meet the man who is one of my country music heroes, but I did manage to press the button of Blake’s replica judges’ chair from The Voice. When I told my friend Carly I was going to New York, she said that there was one thing I HAD to do. More than anything else, including going to a Broadway show or visiting the Statue of Liberty, I needed to get some street-vendor falafel. I’d initially frowned back at the beaming face on the other end of my Skype conversation, but she remained so steadfast that by the time I’d landed the seed had been firmly planted. Back in the hotel lobby my brother called for the lift whist I stuffed my face with the vegetarian delight. It might not have quite matched our view from the Top of the Rock, but it was sure damn tasty. Almost as tasty as the woman who followed us into the lift once it arrived. “What floor are you going to?” my brother asked the short, tanned, 30 year old, beauty squeezed in beside us. “Yeah we can, but from experience most people from L.A. aren’t worth listening to anyway,” I joked. The lift made a *bing* as we reached floor 12. “Enjoy the rest of your trip!” she winked. As the elevator doors shut behind us I stood on the landing and sighed. It was love at first sight.